buynow/bloglater: The Grey Focco! FFS! 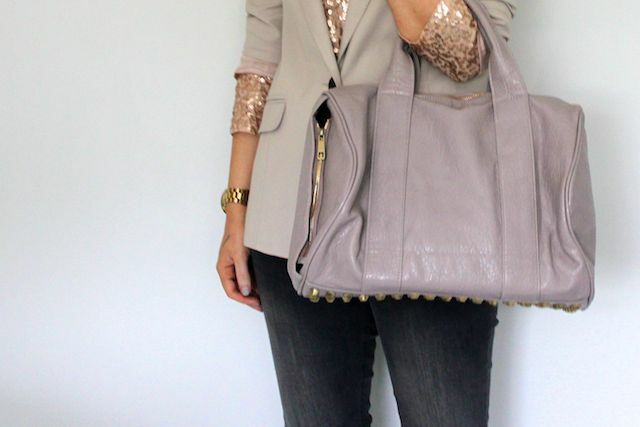 Love love love it :) I'm on the hunt for a bag in this colour, thanks for the heads up! Nothing to be embarrassed about! If you've got something good, why change? Oh my, it's beatiful! I have the black Focco and wanted the grey too, but honestly thought it would be a proper "grey" and very drab. I am absolutely dying to get the tan/brown colour. I don't think I've seen any true to life photos of that colour. Haha, nice to read it's Chanel, as I've had my eye on these for a while, you might just enable me to get a couple, the rose platine looks fab. And this bag, well... I need to go check eBay presto! @Parisa - well i am definitely not getting that one: i have to stop somewhere :) haha I think you should go for it and let us all know what you think! @mw - haha i love it! I was so shocked at how lovely it was when I got it. The photos don't do it justice on eBay. @Ms Bennet - I used the same one as the last two times: http://myworld.ebay.co.uk/bag-that-style-6 - arrived the next day! This bag complements your skin so well! can you tell me where you get it from??? I also caved in since your last post and I got the tan and the grey Frocco! LOVE THEM! Now this one I really do like, still not sure how I feel about the fact it's so clearly 'inspired by' the Rocco though so think I'll resist. That colour is gorgeous! I wanted a black one a while back. Seeing both your bags has just cemented it! I just ordered the black one and am so excited :-)this one looked gorgeous as well !! Okkkkkk this is most definitely the most gorgeous one!! The colour is stunning and I think I need it in my life! Love the colour, it goes so well with the outfit you are wearing. this is by FAR the best one you've shown, not that into black but this is so gorgeous oof! Haaaa, I had a sneaky feeling you would take me advice! Wow, I love this one! So tempted to buy it.. I shouldn't but ahh it's gorgeous! Maybe it deserves a new "What's in my bag" video or post???!!! love that color! want one! This one is probably my favourite color. I love the look of this bag but I'm worried how it will wear long term. Not tempted to get the brown one as well? OK, I fold. I'm gonna have to go out and get one. 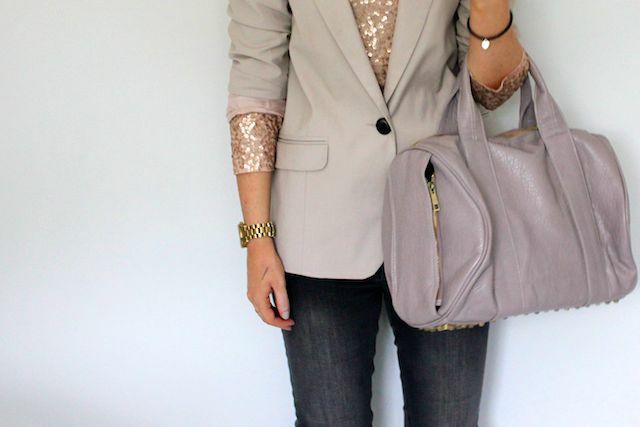 okay- i'm loving this whole outfit! It's ok for the bag post- If there is a bag then you must snag! I think I'm going to have to give in as well :( Such a beautiful taupey grey.. I don't think I have anything like it. You enabler, you!! It's such a gorgeous colour! And will definitely work with everything! Oh God, this looks better than the black. Now I want it! Not sure I can justify the same bag again... decisions! The bestest version yet! Love it. Wow, this bag is really gorgeous. I was going to get the black, but I'm getting this one now. How is the leather/pleather? Can you give us the seller's page? I am always skeptical when it comes to e-bay purchases... but I think I will dive right into getting this bag! oh gosh.. now i'm even more confused about which one i prefer. i want all of them, arghh! I caved. You're the best enabler Laura. Spent all morning drooling and finally couldn't take it anymore. I hope I love it as much as you do. Oh i love this colour Laura, seriously lush <3. ps. i bought this nice tan wedges from asos.com (inspired by your Guess wedges). i wanted to show up a pic but it was sold out the day after i bought.. so now i am just patiently waiting for it. also, i was thrown off the UK sizing.. hahahaha what newbie am i! eBay makes me so happy! Love finding bargains, and selling - people will buy anyting! I am one of those people, I bought a pack of Lucky Charms off there the other day. Help! :/. Time to head to Betty Ford love! man, I love it- i only wish it had a shoulder strap! I agree with a lot of folk that the grey looks best. Spotted Kristin Cavallari with the real Rocco in dark grey (somewhere in a mag) and loved it! Would love to see some comparison pics of the three colours. So I ordered the black thanks to you. Then i was tempted to buy the white because it is such a bargain. And now that I saw your pictures of the grey I'm like, "Hm well, I might as well snag the white AND grey." Love this bag I must have it in this colour and black Thankyou for sharing the link and blogging again I really enjoy your posts. Its absolutely nice, I am currently working from home selling import export goods online my profits have been great. I trade mostly bags and clothes. Where can I get this focco? thanks!